Having a ball and chain isn’t exactly going to make you feel all too dandy. Yoku’s Island Express has a ball and chain mechanic, though it doesn’t mean the game is a crippling encumbrance. The developers went all Oprah on the gamers and the game is going to be released on every platform available, though not on a graphic calculator or an American fridge. So it’s not all inclusive like Skyrim is, though that can only mean the game isn’t as glitchy, and that’s always something to celebrate. Gamers are seen as living a bug’s life. Yoku isn’t living a bug’s life. It’s a bug all right and it’s very much alive, but it’s no antisocial or boring life it lives. The bug called Yoku has been trusted with a very important yet simple task. To be the new mailman and deliver mail to the island’s inhabitants. That’s at least how it starts off. As you progress, you’ll come across new characters who’ll build the world around you and ask you to do things and explain as to why the task falls upon you. It builds the world, step by step and makes it so it feels organic. The story has balanced show and tell quite well, with characters still telling you what’s happened but staying ‘cinematic’ enough for you to see the results of your actions. Yoku’s Island Express is a very artsy game. That’s a very laden statement to make, but that”s what it comes down to. The game has this hand drawn aesthetic to it that just works wonders. 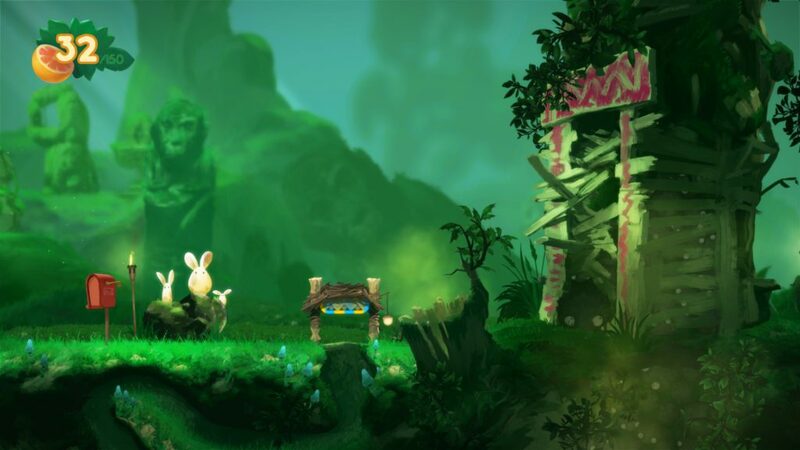 Like Rayman, the environments are hand drawn and the characters are very cute, or at least completely non-threatening. 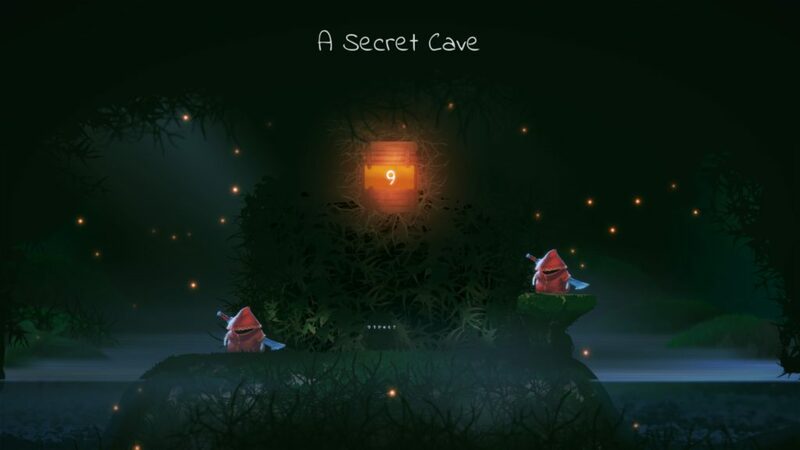 It’s a world that you could get stuck in and not have anything to fear as you journey to unearth the secrets and solve the mysteries of the island. 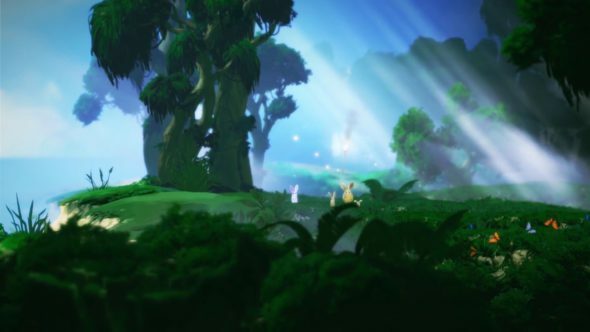 The game does have its dark places, but even they come across as light-hearted and somewhat upbeat, however much of a juxtaposition that can be. It’s done in a purposeful manner because the game wouldn’t gain anything from a sinister vibe, and the developers understood it, clearly. When going through the levels and pin balling your way across the map, the foliage and obstacles sometimes obscure the path ahead. This isn’t that big of a problem when you’re starting off, but as you play and have to take into account more and more things around you, missing cues in the levels can get rather bothersome. Music is so very, very important when trying to convey an atmosphere or complete an environment. Yoku’s Island Express does this thing with the music that’s very clever but can also only be noticed when paying attention to it, which sadly brings forth the underlying flaw the game has with its soundtrack. The beauty of the soundtrack is that it cues out ever so faintly and lets the player hear the hubworld sounds, like waterfalls and rain, but cues back in as you stroll away from these. This is where the flaw becomes apparent that the soundtrack is very, very limited and loops quite quickly. Damned if you do, damned if you don’t. Don’t pay attention to it and miss the painstaking amount of work the developers put into the fading, but if you do, the limited soundtrack becomes apparent. The characters aren’t voiced in the traditional way, they have this ‘Yuka Laylee’ thing going on, where they make random squeaky noises to make it apparent that they are talking to you. 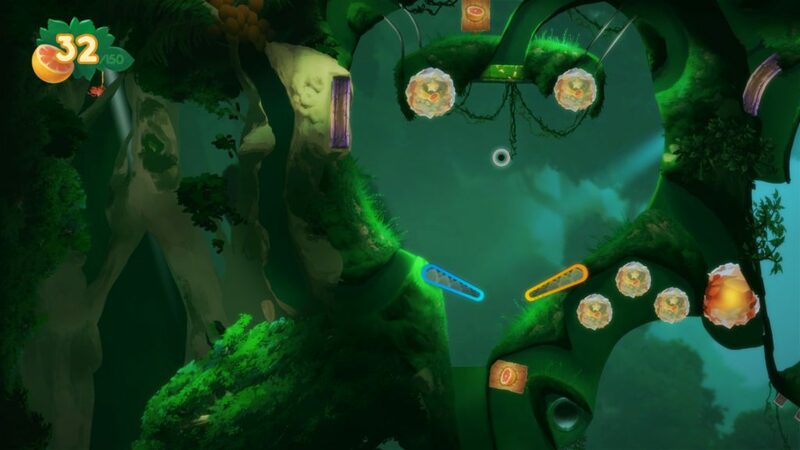 Yoku’s Island Express is a pinball platformer. That’s a genre you don’t see whizzing about very much. Team17 seemed to have taken a little bit of a step out of their comfort zone to publish a game that isn’t about worms and the carnage they wreak, to publish a game about a bug tethered to a spheric pebble. The controls are easy and yet effective. W,A,S,D move you around if you aren’t in a pinball environment, and right and left shift control the bumpers in the pinball parts. It’s up to you to gather fruit to unlock new bumpers in the overworld and thus unlock new parts to explore. Yoka’s Island Express has a metroidvania kind of deal where you need to unlock certain parts of the world to unlock items that unlock other parts in previously unlocked areas. This kind of backtracking would sound boring on paper, but the traversal methods start opening up as you play more and unlock more and more items, so the back and forth really isn’t a big deal. Because the world is so organic in its traversal, it’s possible to play for hours and lose track of time, so it’s not like the game is addictive because of repetition and the possibility of a certain drop, but more of what will happen if I pick up the next thingymabob, or see where the next unlocked pinball pad shoots you to. Yoku’s Island Express, is a fresh breath of innovative gameplay that really shakes things up with the combination of pinball, platforming and metroidvania gameplay. The way the game is structured it’s entirely possible to play for quite some time and still make you want to play it some more.